Tool for heat spreader removal and reinstallation for Intel Skylake and Kaby Lake processors. Dr. Delid can be used for delidding of Skylake and Kaby Lake processors as well as precise reinstallation of the heat spreader after exchange of the thermal interface material (thermally conductive paste). During heat spreader removal, the heat spreader is rotated against the CPU base. This prevents damage of the thin PCB of the processor as the force is distributed to all four sides of the CPU - opposed to only one side when using tools with a sliding mechanism. The heat spreader is removed without jolt or excessive force. 1. 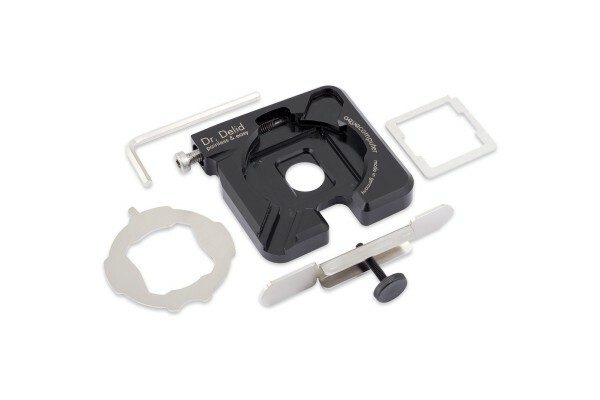 The processor is inserted into an exact, CNC machined recess in the acetal base. The relatively soft acetal material prevents damage to the CPU by excessive punctual pressure or scratching. 2. Before the actual removal process, the CPU is locked in place. The tool can be handled without risk of the CPU dropping from the tool. 3. The removal process is facilitated by rotating the hexagon socket screw by hand using the supplied wrench. A mechanical stop limits the rotation of the heat spreader in the tool. 4. During the removal process, the heat spreader is secured in the tool. It can not hit the CPU die by accident. 5. After removal of the heat spreader, an aperture in the tool allows to lift the CPU from the tool without touching the gold contacts. 1. A stainless steel frame for heat spreader alignment is inserted into a recess in the tool. The heat spreader can now be inserted into the frame, resulting in perfect alignment to the CPU. The heat spreader can be installed with glue (for instance silicone or polyurethane). 2. A stainless steel bracket supplied with the tool can be used to apply slight pressure to the center of the heat spreader, until the glue is cured. A knurled screw made from polyamide prevents damage to the heat spreader. Please note: CPU is not included in delivery! werkt dit gereedschapje ook op een oudere haswel cpu? Hiervoor vragen ze direct Aqua Computer. Wij verstrekken alleen de informatie die we hebben ontvangen. does this support a 9900k? Hello, yes it will fits. Wo ist der Unterschied zu dem und dem Professional??? Die Professional Variante verwendet einen Aluminium Grundkörper, die normale einen aus Acetal. Estamos esperando la entrega. Puede usarlo con el i7 7700k. vale para un i7 8700k?? Ten cuidado puede venir soldado, saludos. Hi, Kann man mit dem Teil auch den neuen 6 Kerner Coffee Lake köpfen? Aquacomputer gibt offiziell an, dass dieses Tool auch mit Coffee Lake-S CPUs funktioniert. Oui, cela fonctionne avec un 4790.
funktioniert einwandfrei! Hab damit meinen i7 8700K ezpz geköpft!